Most of us have heard of a tragic story of some poor soul giving it all up by ending their life in the garage. Close the door, start the car and wait for a precious few moments. 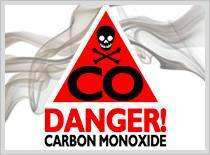 For many of us, that is all the thinking we ever do about carbon monoxide poisoning – which can be fatal. Of all the dangers that the mariner confronts, carbon monoxide poisoning is perhaps the most dangerous since it is odorless, colorless and tasteless. Unarmed, you will never see it coming. Given its dangers, please read on. Burning hydrocarbons, plain and simple. Diesel, gasoline, propane – all are hydrocarbons and carbon monoxide (CO) is a natural by-product of burning them. You cannot tune your engine not to create CO. You can create CO-safe environments around and in your boat but you cannot defy the laws of chemistry. Your engine doesn’t even have to be the one that is on. Your neighbor at the dock has his generator on to power the A/C and TV – and his exhaust is wafting into your cabin. Also, it could be your engine but you think that you are immune because you haven’t enclosed your cockpit. You have only enclosed the windshield and side panel areas, leaving the aft wide open… well, called the “station wagon effect”, an area that is enclosed on 3 sides creates a vacuum behind it as it pushes ahead – and it is sucking CO into the “cup” it has created. What is it and how do you know you are succumbing to it? What do you do now! This strategy could cause two people to die from CO poisoning, not one. IF you know that the only source of CO poisoning is YOUR engine, and you can kill it in a virtual flash, AND introduce fresh air immediately, do it – or get out of there right away and run for help! If you have to play Sherlock Holmes looking for clues, you are playing with your life. Remember, it could be your slip-mate’s engine that is polluting your air. Also, the cabin has obviously built up some degree of CO concentration. It may be a deadly amount and you don’t have a chemistry kit in your pocket. You are gambling with your life. You might consider  grabbing a lungful of fresh air from outside, hold your breath and  try to drag the person out of the cabin. If you can’t,  drop them and run for help. If you can get them out, but they are not breathing, give them artificial respiration (sometimes called CPR) and scream for help between breaths! One, create fresh air paths that keep the station wagon effect from overtaking you from behind. Don’t form that cup – crack a window somewhere and create a jet-stream through your boat. Just be aware that running on a “slow bell*” may still create an opportunity for CO to build up in your cockpit. Two, put carbon monoxide detectors in ALL enclosed spaces, especially sleeping quarters. These devices can be battery-operated and are readily available. $29.95 at places like Home Depot, Wal-Mart, the internet, etc… There are models that can be tied directly into your battery system like a bilge pump – never fails unless the battery itself is dead. * slow bell is putting just enough way on to maintain bare steerage. Back drafting can occur under such conditions – and you’ll never smell it.